1. 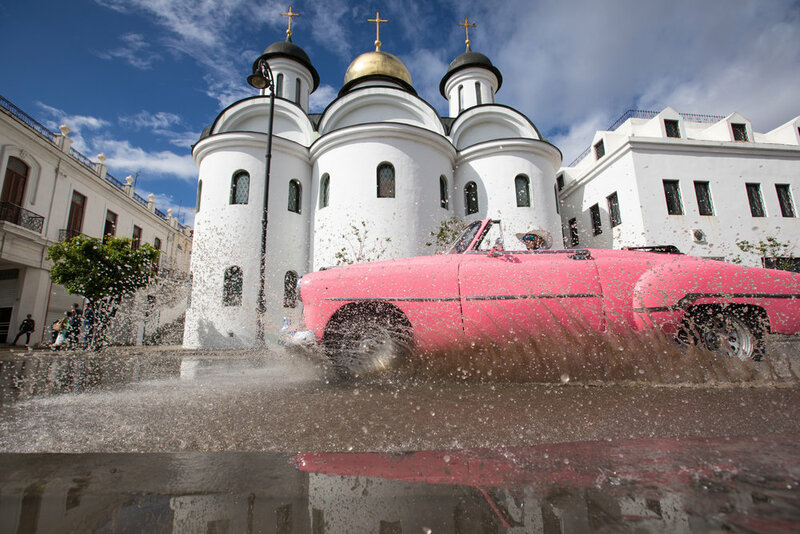 Classic pink car in front of an orthodox church in Havana, the capital of Cuba. 2. Portrait Photography in Cuba. 3. Photo journal - Streets of Havana (Photo Essay for the Sixth Issue of Dezine Magazine). 4. Cuban Street Photography, Musicians in Havana. 5. Horse & Cart on the streets of La Habana, Cuba. 6. Street Portraits in Havana by Geraint Rowland. 7. Fisherman on the beautiful malecon of Havana in Cuba. 1. Havana is full of colourful old classic cars. Here one causes a splash after a rainfall in front of an Orthodox Russian Church along the seafront. 2. The city of Havana attracts over a million tourists annually, subsequently the entrepreneurial locals have figured out ways to cash in such as posing for photographs with the local cigars. 3. The streets of Havana are full of energy and life. Here a taxi driver stops to buy some fresh fruit, while a man on his bicycle sells freshly cut flowers. 4. You hear music everywhere in Havana, here some street musicians play the classic Cuban song, 'Guantanamera'. 5. Along with classic cars you will find many other forms of transport in Havana including the Horse & Cart which is used an an alternative form of taxi for the locals. 6. Evidence of Cuban's communist past still exist throughout Havana. Here a local poses as Che Guevara for the benefit of the tourists. 7. Havana is full of beautiful, colourful, old colonial buildings, many of which have fallen into ruin including these along the seafront. I have written two previous photography blog posts from my trip to Cuba, the first being, 'Street Portraits in Havana, Cuba', and the second, 'Cuba and Cigars'. More of my travel photography from Havana can be found on my website, my Facebook and my Flickr account. This photo journal, 'Streets of Havana' can be viewed in full here in the sixth issue of Dezine magazine. If you are interested in purchasing any prints, using an image online or would like further information please send me an email at: geraintrowlandphotography@gmail.com.